Monogram ring, Initial Ring, Personalized Ring, Engraved ring. This monogram ring is hand crafted of sterling silver. The band is a heavy 4 1/2 mm wide with a 1/2" or (8mm) diameter monogram plate on top. 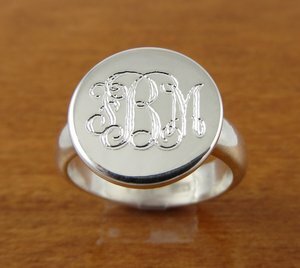 This monogrammed ring has a great traditional look and makes an excellent bridesmaids gift. Your initial monogram ring comes complete in the gift ring box shown in photo. If you prefer a single initial monogram letter instead of the three interlocking letters, you can do that as well. Initial monogram ring sizes range In half sizes from size 4 1/2 to 10 1/2. Please specify ring size and initials in the Notes to Seller box during checkout.